JoyeTech continues to dazzle the vaping community with innovative designs and devices. The JoyeTech eVic Primo Mini Starter Kit is a compact, travel sized incarnation of the original eVic Primo. Don’t be fooled by its small stature. This kit is a powerful vape force to be reckoned with. 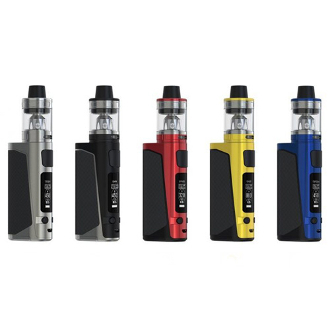 The kit is powered by the eVic Primo Mini Mod. This lightweight mod requires a single 18650 battery to function and has a wattage output capacity of 80 Watts. It sports a temperature control feature that allows you to utilize Nickel, Titanium, and Stainless Steel 316 coils. This mod also is designed with a preheat function, stealth function, and a bypass mode. Its small construction is paired with a carbon fiber design that is comfortable and stylish. The e Vic Mod is coupled with the ProCore Aries Sub Ohm Tank. The Aries Tank has features to make vaping easy as pie. It is designed with a flip top for simple refills and has dual airflow control for optimum control of your hit. <>This tank is adaptable for both Direct To Lung and Mouth To Lung vapers. It comes with a ProC1 0.4ohm coil (for direct to lung vaping) and a ProC1-S 0.25ohm coil(for mouth to lung vaping). This incredible tank provides an amazing experience and produces incredible flavor and vapor.